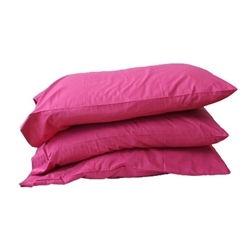 This is our Bright Pink 180 thread count pillowcase. It is made of 50% cotton 50% polyester and measures approximately 21.5" wide x 30" long. It fits a standard size pillow. It has a 2" hem on the open side. You will receive 6 pillowcases per pack. Imported.